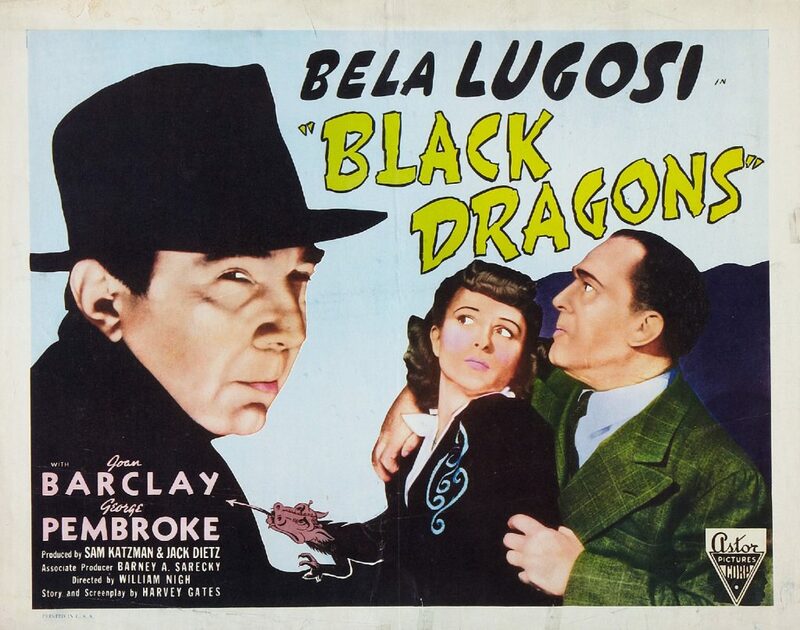 Black Dragons is a 1942 American film directed by William Nigh and starring Bela Lugosi, Joan Barclay, and George Pembroke. The cast includes Clayton Moore (later famous as the Lone Ranger), who plays a handsome detective. The Black Dragon Society also appears in Let’s Get Tough! a 1942 East Side Kids film made by the same team of writer Harvey Gates and producer Sam Katzman. It is prior to the commencement of World War II, and Japan’s fiendish Black Dragon Society is hatching an evil plot with the Nazis. They instruct a brilliant scientist, Dr. Melcher, to travel to Japan on a secret mission. There he operates on six Japanese conspirators, transforming them to resemble six American leaders. The actual leaders are murdered and replaced with their likenesses. Dr. Melcher is condemned to a lifetime of imprisonment so the secret may die with him. The film was rushed into production following the attack on Pearl Harbor. It was to begin filming on 17 January 1941 but this was pushed back until 21 January. The original working title was The Yellow Menace.